A coastal low will bring a wintry mix to the area late Thursday into early Friday. The Thursday evening commute will be impacted. Accumulating snow and sleet can be expected at the onset, before changing over to rain and freezing rain overnight. Hazardous travel is possible. A chance of snow between 2pm and 5pm on Thursday, then snow and sleet. High near 33. Wind chill values between 15 and 25. East wind 5 to 7 mph. Chance of precipitation is 80%. New snow and sleet accumulation of less than one inch possible. Thursday night will bring snow and sleet before 1am, then freezing rain between 1am and 5am, then rain or freezing rain after 5am. Temperature rising to around 33 by 5am. Wind chill values between 15 and 25. East wind 10 to 15 mph. Chance of precipitation is 90%. New ice accumulation of less than a 0.1 of an inch possible. New snow and sleet accumulation of 1 to 3 inches possible. Mostly sunny, with a high near 36. Wind chill values between 20 and 25. Northwest wind 9 to 13 mph. Partly cloudy, with a low around 18. North wind 3 to 8 mph. 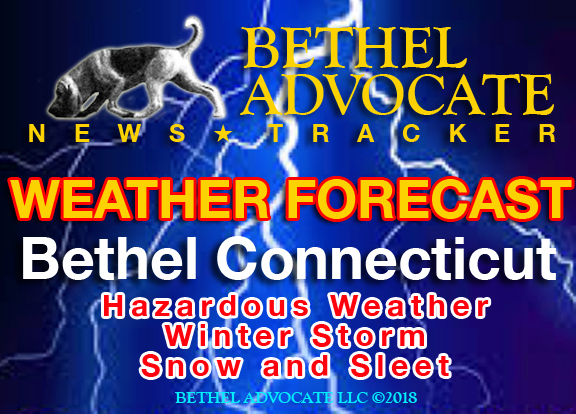 A chance of snow between 2pm and 5pm, then snow and sleet. High near 33. Wind chill values between 15 and 25. East wind 5 to 7 mph. Chance of precipitation is 80%. New snow and sleet accumulation of less than one inch possible. Snow and sleet before 1am, then freezing rain between 1am and 5am, then rain or freezing rain after 5am. Temperature rising to around 33 by 5am. Wind chill values between 15 and 25. East wind 10 to 15 mph. Chance of precipitation is 90%. New ice accumulation of less than a 0.1 of an inch possible. New snow and sleet accumulation of 1 to 3 inches possible. Rain, mainly before 1pm. High near 39. Northeast wind 10 to 15 mph becoming northwest in the afternoon. Chance of precipitation is 90%. New precipitation amounts between a quarter and half of an inch possible. Cloudy, with a high near 40. A chance of rain and snow between 8pm and 11pm, then a chance of snow after 11pm. Cloudy, with a low around 27. Chance of precipitation is 30%.